• Oklahoma owns a 7-2 all-time record against West Virginia and is 5-0 in the series since the Mountaineers joined the Big 12. The Sooners are 3-0 in Morgantown (won 50-49 in 2012 and 45-33 in 2014). • OU has won its last 11 true road games and 22 of its last 24. It is the longest streak of Bob Stoops’ career and the fourth longest in program history. The Sooners have outscored their last 11 true road opponents, 559-289 (51-26 average). • Oklahoma has scored at least 30 points in 16 straight true road games. The next longest current streak by a Big 12 team is three games by Oklahoma State. • The Sooners have won 15 straight Big 12 Conference games, the second longest streak in program history. It was also Oklahoma’s 10th straight Big 12 road win, the longest streak in program history and the second longest in Big 12 history. • OU’s 316 rushing yards on a season-high 64 attempts are the most given up by WVU this season. They entered the game allowing just 156 rushing yards per contest. The 64 attempts were the second most in the Stoops era behind 66 against Iowa State (10/19//02). • OU entered the game with 10 takeaways and 10 turnovers in Big 12 play. It notched three takeaways in the frst half and fnished the game with four, a season high. The Sooners have forced seven turnovers in their last two games. • Oklahoma’s 34-7 lead at the half marked its largest halftime lead in Big 12 play this year. • West Virginia entered the game having held five of its six Big 12 opponents to 21 points or fewer on the year. OU scored 21 in the frst quarter. The Mountaineers’ opponents had averaged just 16 points per game in Morgantown this season. The Sooners fnished the frst half with 34 points and scored 56 total. • West Virginia entered the game ranked first in the Big 12 in total defense, giving up 383.3 yards per game and scoring defense, allowing just 20.2 points per game. 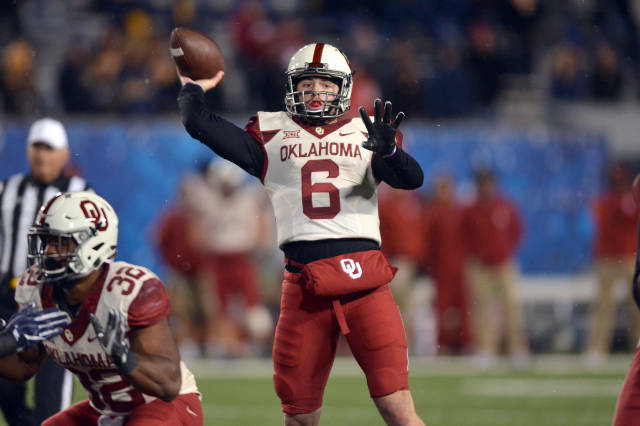 The Sooners racked up 485 yards of total offense (third highest total by a WVU opponent this year) and 56 points (the most by a WVU opponent this year, previous high 37). • Running backs Joe Mixon and Samaje Perine each topped the 100-yard rushing mark in the first half, marking the fourth time they have each gone over 100+ yards in the same game in their careers. It also marked the frst time since 2008 that OU has had multiple 100-yard rushers in back-to-back games (DeMarco Murray and Chris Brown against Texas Tech and Texas A&M).